Available to Order. Estimated delivery is 26/04/2019. If you're a relatively new DJ to the pro circuit and you need a solid cartridge to up your game, the Ortofon Concorde Pro DJ Cartridge is an excellent choice. 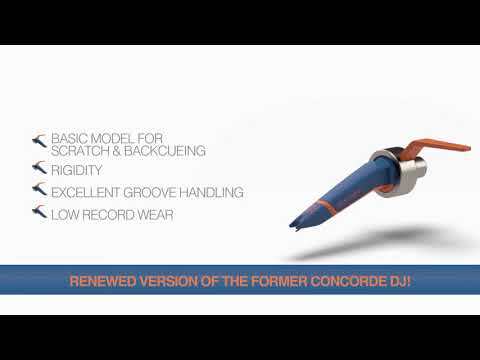 This excellent quality spherical stylus is perfect for any talented DJ that likes to scratch and will prove very durable. The Pro DJ Cartridge has been crafted with great care to ensure that it performs at its best consistently. The hard-wearing blue shell is stylish and helps to give just the right amount of weight. Both balance of frequency (20Hz - 20kHz) and output volume make sure that you get the best sound from your vinyl. Because the Pro DJ Cartridge has a spherical stylus, this makes it less prone to wear and tear which can result in a duller sound over time making it ideal for busy DJ's and those that like to practice for long sessions. Ortofon has a superb reputation when it comes to high-quality DJ gear and the Ortofon Concorde Pro DJ Cartridge is certain to help you get the best sound from your vinyl.